Carolina's Private Elite Coaching Can Help You Take Your Life And Business to The Next Level So You Can Finally Have Your Breakthrough! Over the last 8 years, I have been working with personal brands and businesses, helping them attract more wealth, more clients by harnessing the power of social media and digital traffic. 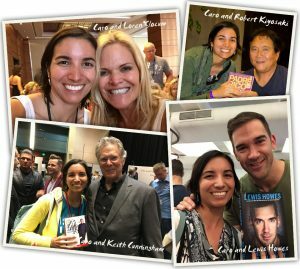 I've been able to build a 7-figure Coaching, speaking, marketing and affiliate business. If you want to travel the World, live life on your own terms, and most importantly, make an impact, then I would love to work with you. I'm here to help you overcome the hurdles that are keeping you from making money. The biggest hurdle is YOU and YOUR MIND, which is blocking you from it. And we're going to work on that, and of course, on all the strategies you need: traffic, leads, conversions, sales funnels, branding, video marketing, building relationships and your social media presence! The good news is that I can personally help you solve the problems that are keeping you busy and broke. And sometimes, not even that busy. "From just One Coaching Call with Carolina I got strategies to i mplement in my business that generated $13,000 in sales for me! She's been an amazing Mentor!" - Chiara Francica, Online Entrepreneur. You see, as Zig Ziglar said, It's not a lack of time that is keeping you from getting what you want, it's lack of direction, and I'm here to give you the direction you need. I've already come a long way in my business, and I can help you get to the next level, even if you're just starting out. We will start by getting rid of all the limiting beliefs that are keeping you from getting what you want and deserve. You'll have my support and step by step instructions that you will have to follow in order to build your brand and your business online in 2018 and the next few years to come. My private coaching is for anyone who feels it's time to take their success seriously. It took me a few years to actually transition to that mindset. It took me a while to look at it as a way of life and not just a hobby. And it's time you do the same, are you ready? I want to help you create a life and business that you feel passionate about! Want the accountability they need to help them keep up with their business and marketing goals. Want to build a sustainable income stream through the internet by doing something they love. Want to know what it takes to become a leader and follow step by step instructions that will take them there. So if you're ready to invest in yourself through my Mentoring Program, fill out the form below and my team will contact you for more details! Me puedes escribir cuál es tu blog en español? Te vi en momento en PNLtv y estoy muy interesado en ver la información que publicaras el 10 de marzo 2016 para marketing. Hola Carolina, como estás ? Estoy empezando en éste mundo de marketing online, ecommerce, affiliate marketing, etc. He tomado algunos cursos, pero veo que tus conocimientos y tu emprendimiento ha sido espectacular, y por lo caul deseo aprender de ti. En un mail anterior hice mi solicitud de contacto para un coach one on one por skype, pero no he visto respuesta o solicitud de contacto. Me gustaría poderme poner en contacto contigo. Mi nombre es David Gutiérrez, soy de Bogotá , y me gustaría en unos años llegar a donde TU has llegado. I saw your webinar and yes I would like to get a Mentor who is willing to help me.I.m already in Mobe. But never got into any success. I need a good Mentor. I really like you Webinar. Autoresponders such as the high grade ones found at to help a business generate a high return on its investments. to explain how PR could thrive by managing public opinion.